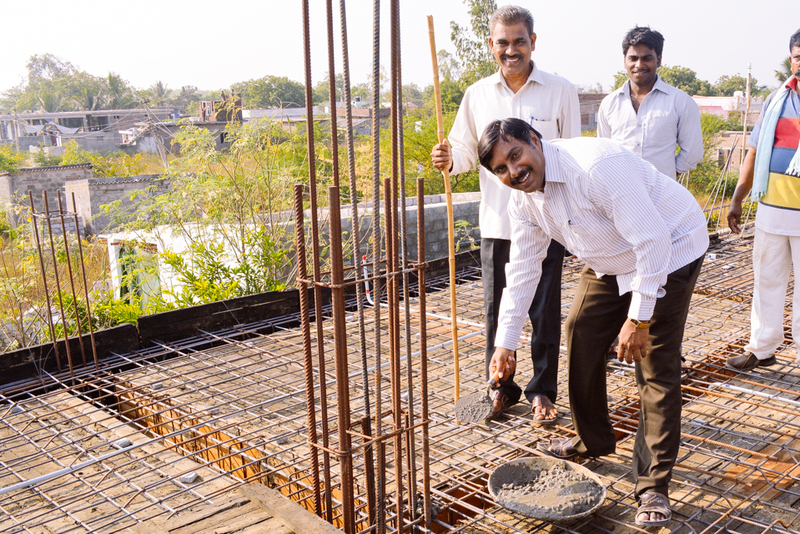 Photo: Our India director placing the ceremonial first trowel of concrete onto the roof slab of the new high school building. Today we bring you news from our native team in India, who recently suffered from severe storms in the area. We received damage to our entry drive which spans a ditch, and lost some bathroom doors which will need to be replaced. Our team will be working on repairs over the next few days. Thankfully, we received a new generator this week, a timely blessing after the storms. The generator will help keep the entire campus powered during the frequent power outages experienced in this part of India. This is meant to be a supplement to our solar power system, which is not able to power everything on campus. Even with these setbacks due to unpredictable weather, our hard-working staff is very busy preparing for the new school year which begins at the end of this month. We believe that the new building for our on-campus high school at our main campus will be ready in time. Currently, construction of the walls is underway and almost complete. Other recent progress in construction included pouring the concrete roof slab, which completed phase one of the construction project — the framing of the building — and laying down the concrete beams to secure the foundation and raising the concrete pillars, both of which enabled us to create a strong, durable building. Photo inset: (Top-left): Our on-campus school is in need of new desks to replace the old and broken ones we currently have. (Top-right): Construction of the walls is currently underway at our on-campus high school. (Bottom-left): The new generator will help keep the entire campus powered during the frequent power outages experienced in this part of India. (Bottom-right): We purchased a school bus in August 2015, which meets one of the requirements for our high school’s full accreditation. We decided to start a high school on our campus because our children have to travel very far to attend higher classes, sometimes the girls struggle with social problems, and our children are treated carelessly because they come from families below the standard poverty line — they are of the lower castes and Dalits (outside of the caste system, “untouchables”). Often times culturally, they are considered to be the lowest people in the society, so we want to encourage them, love them, and display their talents to the society, as well as give them sufficient care and protection. There is no high school in this area, so we also plan to offer our high school to the public — not just our orphans living on campus. We hope that the tuition paid by outside students will help generate more funding for our orphan care program, bringing us closer to our goal of 100% sustainability. We are facing some challenges with getting the high school fully accredited because there is not adequate land space to build a playground. With your support we hope to purchase a half acre of land adjacent to our main campus where we want to build a new playground for the children — we had to dismantle the existing playground in order to build the high school. Purchasing the adjacent land and building a new playground is also important because we need proof of a children’s playground in order to maintain our status as an accredited elementary school with the educational department as well. We are happy to report that we have already met the other requirements for our high school’s full accreditation: we purchased a school bus in August 2015, and we have all of the required facilities such as classrooms, a lab room, a computer room, and an office. With your continued support, we are seeking to raise $1,000 per month in new monthly donors to cover the expanded costs of hiring additional teachers. We are also in need of new desks to replace old and broken ones, and textbooks, notebooks, educational materials, school uniforms and shoes, and school bags. Profits from our farmland enterprise are covering a portion of these needs, but we also rely on donations to cover the remaining amount. We are seeking to raise $8,147 for the new desks, school supplies, and uniforms for our children.